Justin Shedd leads a classroom discussion using ArcGIS Online. Various school groups have visited the Center for Geospatial Analytics to explore its innovative tools and technologies. This semester, a local science teacher contacted the center to request a guest speaker who could bring their expertise in spatial problem-solving to his classroom. “We’re wrapping up a unit on mapping,” wrote Joe Brinkman, a teacher at Thales Academy in Apex. “I wanted the kids to be able to see that there is more to maps out there in the real world, utilizing some cool technology these days.” Research Associate Justin Shedd answered the call. 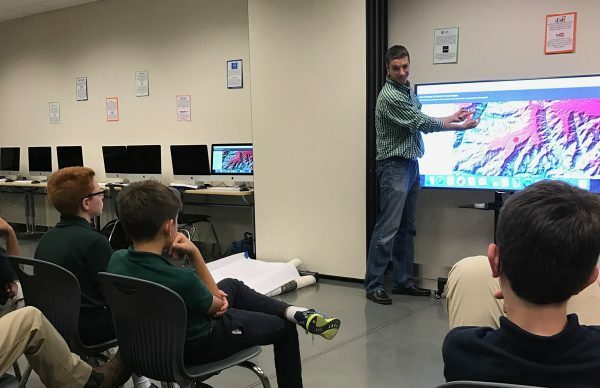 For the over 50 sixth- and seventh-graders in Joe’s classes at Thales, Justin led a discussion of digital mapmaking and helped the students understand what maps can convey and what questions they can answer. “All maps tell a type of story,” Justin says. With ArcGIS Online, he was able to show the students different kinds of interactive maps and how to create their own. 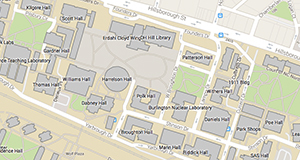 He particularly encouraged them to take advantage of troves of publicly available datasets to create their maps. The result was a variety of unique applications: Some students chose to map the locations of their favorite food chains, with data embedded to show hours of operation and other info, while other students used data from the Town of Apex to view the spatial arrangement of polling places or infrastructure such as utility lines. Thanks to Justin for volunteering his time and providing a great classroom experience!